I saw this picture on Pinterest when we first moved to Germany and my jaw dropped to the floor. Where is this and when can we go? 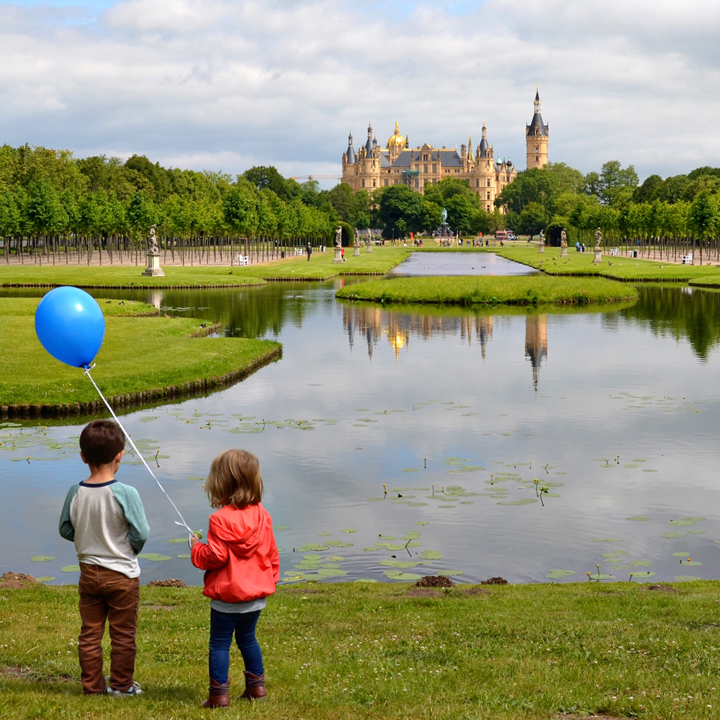 Answer: Schwerin Castle, Sunday June 21st 2015. Schwerin is the capital of Mecklenburg-Western Pomerania and is coming into its own as state capital after decades of Eastern Bloc poverty. 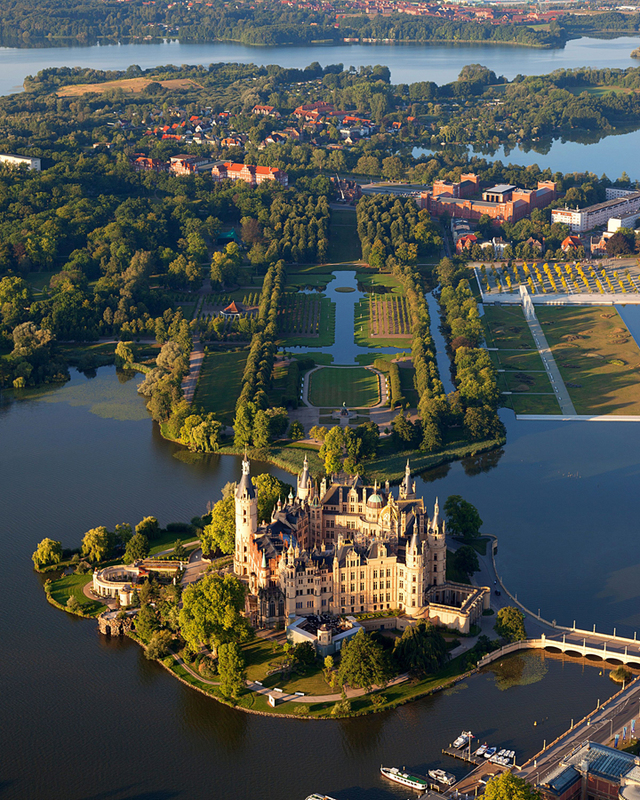 With an intriguing old town and ringed by lakes, Schwerin is a worthwhile destination all on its own. Add in the fairytale castle and this is a must see. Can you believe this place? It is amazing. The turrets and gilt are gloriously over the top. An equestrian statue of Niklot, a Slavic prince who occupied the islet until defeated by Henry the Lion in 1160, adds a touch of imperial bombast. 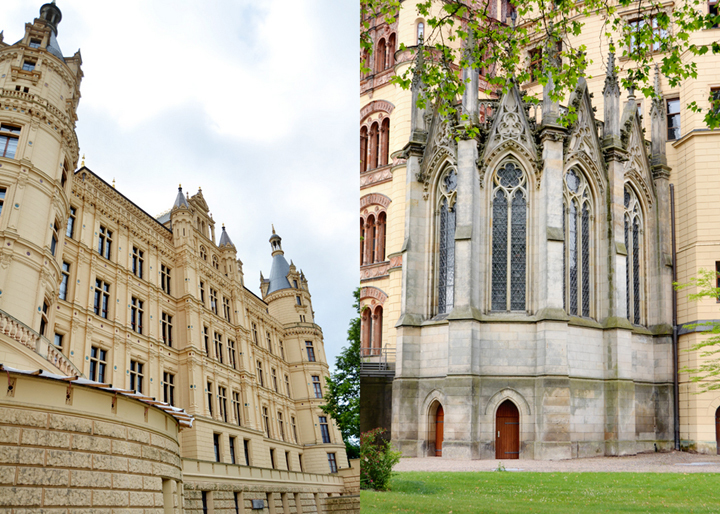 The palace is Paul Friedrich Franz II's treat to himself after moving from Ludwigslust to Schwerin in 1837. The Duke looked to Chambord Chateau and told his architects to remodel his ancestor's Dutch Renaissance-style castle accordingly. Check out this beautiful garden. Looking out to a lake. Only a little construction happening on the exterior which is awesome because recent search pictures show the entire tower covered in scaffolding. On the right you can see a chunk of the old palace. The rest of the structure is pure fairy-tale fantasy. I'd love to eat dinner inside! Charming. Charming! 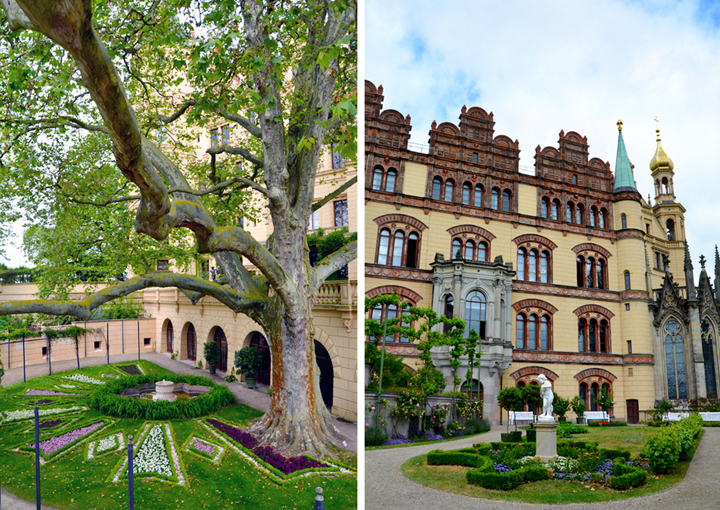 The schloss is a lovely mash-up of architectural exotica-fairy-tale turrets, lantern cupolas, onion-bulb domes, a couple of almost Moorish pavilions, a gothic chapel, and topped with a golden tower. Yeah, I wouldn't mind living here. There are small gardens and grounds around the castle since it is located on a islet with only two bridges to the mainland. Super interesting looking tree bark with initial and name carvings. Looks like the army uniforms I see all the time, just a different color scheme. We circled the entire building ooh-ing and ahh-ing at it. The castle has essentially six different facades so every angle is something new. We loved this tree. It was huge! I don't think I've ever seen a branch like this that connects two different trunks of separate trees! How does that even happen?! Chris thought it might be a support pole they disguised. I don't. It looked too real. Looking up at the front as we entered. There was some sort of political fair day thing going on inside. It was jam packed! But, it was also free so there's that, and the kids got some balloons and candy from some various German political parties. Not only is this place a historic monument with sumptuous royal rooms, but they also converted the unfinished portions into the parliament chambers for the state's government. The interior courtyard from inside the castle. Looking out towards the town of Schwerin from right by the equestrian statue. I had to go find a certain view of the castle so after touring the inside we went to the back of the gardens which are on the mainland and found just what I was looking for. Canals in the schloss gardens. Palace, castle, church, modern parliament, park, and gardens. Schloss Schwerin is definitely amazing and a half. Soooooooo gorgeous! Wow!! What a place!! And that last photo of the kids in front of the castle .. that is beyond PRECIOUS!!!!!!! ....I know, another Schloss (and Kirche), that's what you get when you travel in Germany! Love the gorgeous photos, especially the last one--priceless! What a fabulous way to celebrate Father's Day! Thank you for sharing your adventure to this jaw-dropping site.